Summer is the most popular season for visiting West Yellowstone, and it's no wonder why. Surrounded by national parks and forests, covered by blue skies, and filled with wildlife, you're guaranteed the best in outdoor adventures. With so much to do, planning your trip can get overwhelming. Follow these suggestions for your most complete West Yellowstone summer vacation. When you're in a place as naturally beautiful as West Yellowstone, camping can be your best lodging option – for your enjoyment and your wallet. Pitch a tent at in the backcountry of Gallatin National Forest or choose from an array of private and state-run campsites, many of which are RV accessible as well. Inside Yellowstone National Park, reserve a site at one of the 11 campgrounds within the park for as little as $12 per night. Wildlife sightings are some of camping's greatest benefits, but make sure you're up-to-date on grizzly protocol – these giant animals are notorious for sniffing out un-bear-proofed campsites. 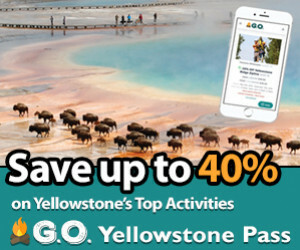 Book early, book smart: tourists flock to West Yellowstone in the summertime, and hotels are often filled for the season by late spring. For the best deals and prices, ask about summer promotions when you call. The West Yellowstone Airport is just two miles from town, but with only one runway flights can be scarce. Try flying through Bozeman, Idaho Falls, or Jackson instead. Then rent a car: while each airport can provide shuttles, there's no public transportation system in West Yellowstone. 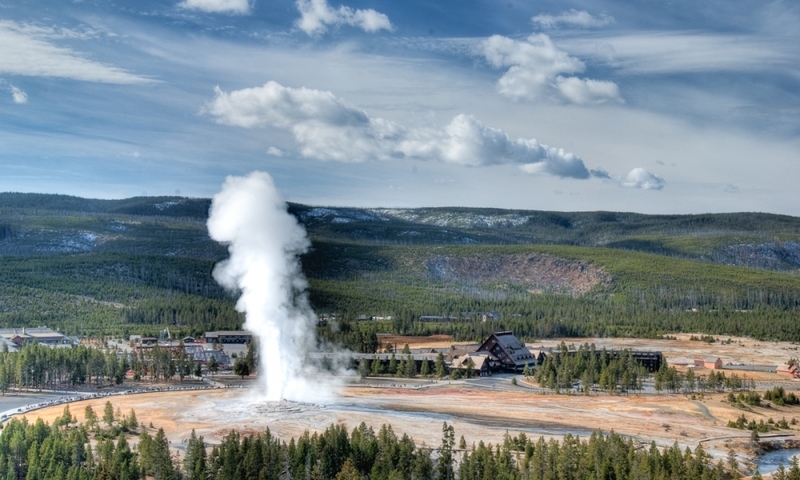 The roaming wildlife and geothermal landscape of Yellowstone National Park is what draws most people to West Yellowstone, and as your $25 entrance fee covers seven full days, you may want to spend a few nights in the park. Take two full days to explore the major attractions, starting from the west entrance and circling the park loop counter-clockwise. Day one will take you past bubbling mud pots, steaming fumaroles, and smaller geysers on the way to the big show of Old Faithful. Spend the night in the open fields of Bridge Bay Campground (book in advance by calling 1-866-GEYSERLAND!) on Yellowstone Lake, then continue North to check out Yellowstone's Grand Canyon and Mammoth Hot Springs until you loop back around to West Yellowstone. Drive South of West Yellowstone and 45 minutes later you'll hit the 25-mile Mesa Falls Scenic Byway. On this gorgeous drive you'll see sweeping views of the Tetons and Lower Mesa Falls, plus bask in the mist of Upper Mesa Falls when you hike to the 114-ft brink. Stop at the Grandview overlook to take in the expanse featuring 65-ft Lower Mesa Falls, the Snake River, and Henry's Fork. When an earthquake caused 80 million tons of rock to slide, blocking the Madison River in 1959, Quake Lake was created in a matter of days. Now, you can paddle the six-mile lake, gliding over the tops of trees submerged by the sudden flood. Post paddle, stop by the Quake Lake Visitor Center to learn the lake's history and check out views of the slide area. Explore Virginia City and revisit the days of the Wild West in this historic gold-rush boom town. Pan for gold in Alder Gulch, then catch a lift in a stagecoach to see an old-time melodrama by the Virginia City Payers at the Opera House. If you're feeling ambitious, use your seven-day Yellowstone National Park Pass to tackle this 27-mile hike in Yellowstone's most remote region. Start off Yellowstone's beaten path at the Bechler ranger station and hike through Bechler Meadows to Bechler Canyon, where you'll bask in the mist of Ouzel, Colonnade, and Iris falls. Then it's on to take a dip in the warm temperatures of Mr. Bubble Hot Spring at the Three River Junction before you end your trip in the midst of the action at Old Faithful. Start at a local sporting goods store – you can pick up your $25 Montana fishing permit and hook up with guide who will point you in the right direction for world-class fishing on the Yellowstone, Gallatin, and Madison Rivers, or Hebgen and Quake Lakes. Try out the cowboy lifestyle with a pack horse, a wrangler, and a guide as you explore the wilderness on horseback. Stop to fly fish, cook over an open fire, and sleep under the stars with the horse-packing guide of your choice. Even tackle 80 miles of beautiful and diverse terrain in Yellowstone National Park on a six-day trip with an in-park outfitter. You won't find a golf course directly in West Yellowstone, so your best options for public greens are in nearby Island Park or Big Sky. For a smaller, closer course, the Island Park Village Resort is a nine-hole, par-35 course 30 minutes South of West Yellowstone. An hour North of West Yellowstone, play on Big Sky Resort's 18-hole par-72 Arnold Palmer Course in the shadow of Lone Peak. Spend the day riding and flying over the 10,000 acres of open sand when you rent a buggy and hit the dunes an hour South of West Yellowstone in St. Anthony, ID. Ride your mountain bike where the Union Pacific rail bed once ran between West Yellowstone and Island Park, Idaho, and you'll enjoy 30 miles of wilderness scenery and wildlife sightings Rent a and watch out for wildlife as you pedal the 30-mile stretch of that runs between. Start early and head to the Watkins Creek trailhead where you'll hike through open sage brush and climb 500 feet over five miles up to Coffin Lakes. There, you'll find peaceful alpine water along the continental divide. If you're up for a detour on your way back, hike the extra two miles to Sheep Lakes. These grizzlies and wolves can't live in the wild, so the Discovery Center has given them a home. If you miss out on a glimpse of them in the wild, you'll be sure to get an up close look at these magnificent beasts at the Discovery Center. There's a reason this was the first National Scenic Water Trail in the country, and as you float this five mile stretch of Henry's Fork, that reason will become as clear as the water beneath you. Put in at the sign on Big Springs Road/Idaho Highway 84, then sit back, check out the scenery, and watch out for wildlife – bald eagles above, huge trout below. Take out at Mack's Inn after your leisurely four hour float. Feed the trout from the bridge at Big Springs and watch as trout swarm the clear waters of this 52-degree spring. Each day, 120 million gallons pour from the spring, forming the headwaters for the Snake and Henry's Fork Rivers. Fishing is prohibited and the water is incredibly clear, so you'll be sure to get a good view of the huge fish that crowd the waters. On a rainy day head to what was once the Union Pacific Depot. Now, it's the Yellowstone Historic Center, a museum where you can see old trains, stagecoaches, and buses, and learn about the history of transportation to Yellowstone National Park. Rapids range from class I-IV on the Gallatin River, so you can find the perfect stretch of whitewater for you. Hire a guide and hit this raging river all summer long. Saddle up for the Silver Lake Loop trail at Harriman State Park with the park's riding outfitter. You'll skirt the shore of Silver Lake, gallop over rolling hills, and view the elk and moose that frequent the northwest end. Just take your pick of local restaurants- you'll find many down-home Montana establishments right in the center of town. Enjoy a burger at The Gusher Pizza and Sandwich Shoppe, or head over to the Timberline Café for a buffalo rib eye steak. For breakfast, Nancy P's Baking Company offers the best baked goods in town. The Broadway of West Yellowstone, the Playmill theater rotates several impressive musical and theatrical performances each summer (406-646-7757). Break out your spurs and hang onto your cowboy hat at the West Yellowstone Rodeo each weekend. You'll join in the rowdy crowd as cowboys come face to face with bucking broncos. Call 406-560-6913 for dates and times. If bears in the park are being shy or weather turns sour, experience Yellowstone's wildlife on a giant screen at the Yellowstone IMAX Theater. With 12 thousand watts of surround sound and a screen that's six-stories tall, you won't feel like you missed out on the real deal. Call 888-854-5862 for dates and times. Make your way to the town park lawn with a blanket and chairs for West Yellowstone's free outdoor concert series, weekly July through September. Find out what it was like to live as a frontier mountain man at the Smoking Waters Mountain Main Rendezvous each August. Listen to folk tunes as you watch mountain men participate in black powder shoots, knife and tomahawk demonstrations, and open-fire cooking– all for free. Watch the parade of old-fashioned street rods that crowd west Yellowstone's streets for a weekend each August as you eat barbeque and listen to live music at this free event. On a rainy day head in to the Bear's Den Cinema to watch a feature film on a full sized screen. With 125 seats and surround sound, this is West Yellowstone's only year-round movie theater.